The Communicator tab in the SciFi Plugin allows you to transform your voice into a walkie talkie type voice, a communication channel, pilot chatter, or helmeted soldier. This effect has been used in many different movies and PC games in varying degrees. Some examples where this effect has been used are from: Star Wars, The Empire Strikes Back, Aliens, Armageddon, Freespace 2, and Battlezone. 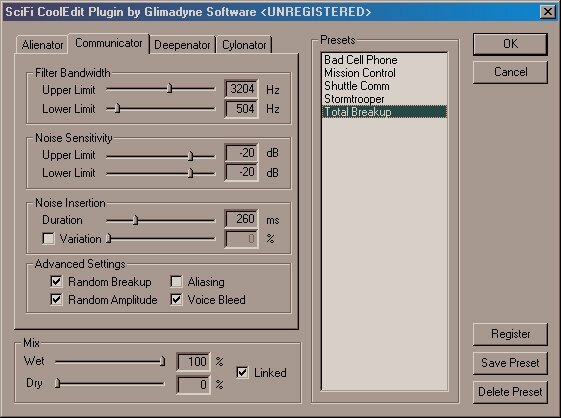 Sets the upper frequency of the filter used to change your voice. Sets the lower frequency of the filter used to change your voice. Noise sensitivity is used to insert static bursts in the voice or sound file based on the power of the sound. This allows one to create communication type voices with the end static bursts automatically inserted at the end of the speech. The power value (in dB) that triggers the noise logic. When the power in the sound or voice file exceeds this value, the algorithm triggers the noise logic and then waits until the Lower Limit power value is met. Once the lower limit power value is met, random noise is inserted at that time. This allows you to automatically insert static bursts after voice. For example, if you are using a voice file and the upper limit is set to -20 and the lower limit is -50, then once the voice power reaches -20 dB (a typical value), then the noise logic waits until the voice power reaches -50 dB (a typical value of silence). When the algorithm sees this, it then inserts static to emulate "end static" as heard in typical walkie talkies and the sort. The power value (in dB) that tells the noise logic to insert a static burst. Used in conjunction with the Upper Limit. If you want to insert end static after speech, make this value low and the upper limit high. If you want to emulate a channel "breakup", set the upper and lower limits near each other and static bursts will be inserted throughout the file if the upper limit is met. The length of the static bursts inserted as defined in Noise Sensitivity. Value is in milliseconds. The higher the number, the longer the static burst(s). When enabled, changes the sound of the static bursts. The slider control determines how often (percentage) the static changes. 100% causes each static burst that is inserted to sound different. When checked, this inserts random silent periods within each static burst. This emulates a radio "breaking up" with silent passages mixed in with static. When checked, this randomly applies different volumes to each static burst in order to give a more realistic and changing volume effect to each burst. When checked, this results in a tinny sound to your voice. It emulates an interesting walkie talkie or communication channel. When checked, this mixes in a portion of the processed voice within the static burst. When unchecked, the static completely replaces the voice that was previously there. Voice bleed allows one to emulate a radio channel but with the voice still heard within the static bursts.